The Regional Disaster Preparedness Organization (RDPO) created the Emergency Toilet Project to provide information to the public about how to stay healthy after a disaster. Funding was provided, in part, by the Urban Areas Security Initiative grant program through the U.S. Department of Homeland Security. See below for information about proper source attribution. Read the Emergency Toilet Guidebook to learn more about how to stay healthy after a disaster. After a strong earthquake, we may need to know how to live without running water and working toilets for weeks or months. Diseases like cholera can spread when human feces (poo) are not handled and stored safely. Read our guidebook to learn about safe post-disaster toileting options. These materials provide basic information about the twin bucket system, latrines (pit toilets), and septic systems. Before a disaster, distribute the materials widely. After a disaster, post them in public areas to help spread the word about safe toileting practices. You can use any 5-6 gallon bucket to separate your pee and poo. You can even use an old paint bucket. Read the Emergency Toilet Guidebook (above) for suggestions about where to find free buckets in your community. These documents were designed to be printed as stickers and placed on poo and pee buckets. You can also print them on card stock or regular paper and use packing tape to affix them. Pellet stove pellets make great composting material. They are compact and affordable. It can be hard to stay clean when there is no running water, but staying clean helps you stay healthy. You can buy a siphon-pump hand washing system or build your own for around $10. Read the Emergency Toilet Guide (above) for more info. Emergency Toilet Graphics (PDF) Contact us if you'd like access to these images. After-Event Talking Points - For use by Emergency Managers, Public Health officials, etc. In 2016, Sue Mohnkern of Washington County Public Health (in Oregon) led the RDPO’s Regional Disaster Sanitation Task Force to develop guidelines for disaster sanitation following a Cascadia Subduction Zone Earthquake. In 2017, the technical content created by that task force was passed to the RDPO’s Regional Disaster Preparedness Messaging Task Force under the initial leadership of Felicia Heaton, formerly of Portland Bureau of Emergency Management, and then Cynthia Valdivia, a bilingual outreach and multicultural public educator with Washington County Public Health. 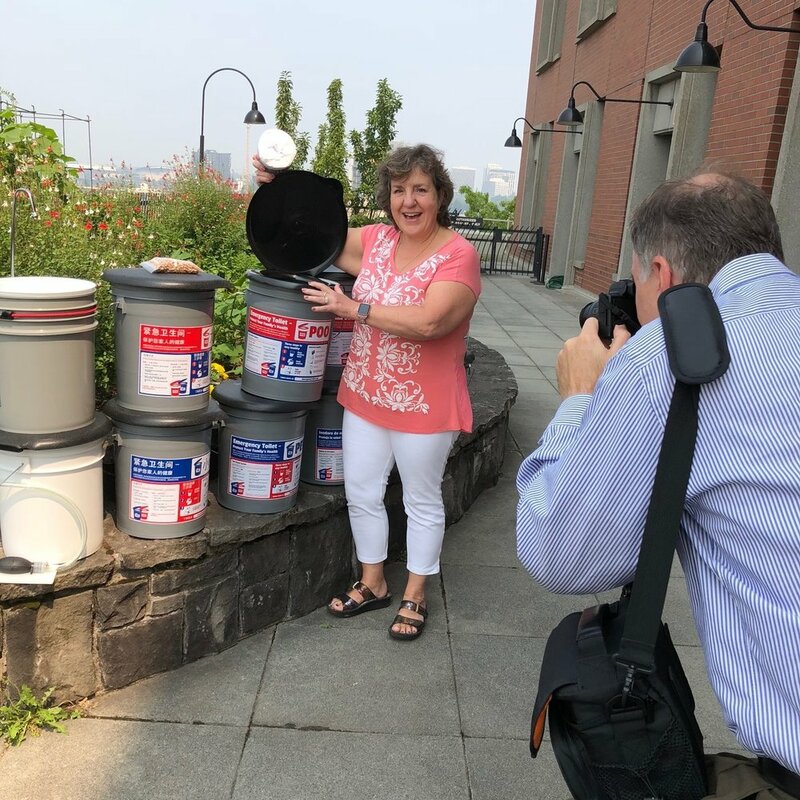 With the help of an Urban Areas Security Initiative (UASI) grant, the RDPO hired Portland-based consulting firm Barney and Worth to help transform the disaster sanitation guidelines into pre- and post- event educational tools. These materials are not to be used for commercial purposes. Anyone may use the materials for non-commercial purposes, as long as they site the source: "Regional Disaster Preparedness Organization of the Portland Metropolitan Region, with funding from the U.S. Department of Homeland Security/Urban Areas Security Initiative (UASI) grant program."